Take a virtual tour by flying Drone just to get a hint of the vast inventory in this treasure hunting experience. You have to see it to believe it. Check out our website for other items for sale. Custom order Doors & Windows at HUGE discounts. Solid Wood trim, MDF, Dimensional finish wood, millwork like quarter round, base shoe, crown, picture frame…..
CVG in Douglas Fir, Western Red Cedar, Hemlock and Alaska Yellow Cedar at unbelievable low low prices! Hand tools, Hinges, Gates, Gate hardware some selling for 75% off list, Safety and shipping supplies plus more! Be sure to check out our low prices on PT Lumber (Pressure Treated) dimensional lumber. Plywood at low prices, this inventory fluctuates so call first. Also the lowest prices anywhere on Red Cedar Deck boards, fencing, Lap Siding and other Cedar. 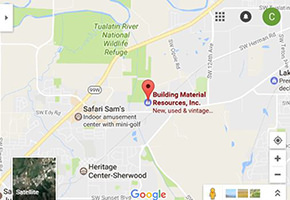 Our Family owned Discount Building Material Warehouse can supply you with the material you want and need at the lowest possible prices. Stop paying retail for Siding in lap and T-1-11, Doors with the largest collection of doors on the floor you have likely ever seen with quantities in the 1000’s in entry, interior, shaker, craftsman, mid century modern and more. We also have an in house service to put the door you get from us in a jamb for you to hang in your building. We also special order doors at a discount from several different manufactures and suppliers. We have budget utility and economy wood also and short lengths of much of what we sell. Red Cedar Decking and fence boards priced so low many drive for hours and save so much money they return again and again. Deck screws and woodworking screws at the lowest prices plus discounted tools and hardware. Shiplap and T & G material with so many choices you may have a hard time deciding on Fir, Spruce, Pine, Hemlock or Cedar.